Hello! Wishing you a happy Monday. How many of you are excited for fall? Can you think of wearing a shirt dress in the colder weather? I was not left with many options so I thought of doing it as a summer staple, though, I would like to take up the challenge later. As demure as they can be, shirt dresses can be dolled up too. I've had this bralette for quite some time but haven't been able to show it off. :P I thought this would be the best opportunity to do so. The almost colourless shirt dress came to life when I wore it with the bralette. Roseleen too did a post on the shirt dress some time back. The year is almost coming to an end and I am nostalgic when I see the year 2015 in flashbacks. I can see how we wanted to share what we know about fashion with you. The immense love you showered on us. The constant support and criticism. 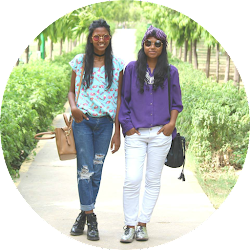 Everything helped us grow as individuals and as bloggers. Kindly stay in touch so that we can share our ups and downs, achievements and failures with you and in return, learn much more. Your look is fantastic! ♡ Kisses!! I absolutely love how you've styled it! Such a unique and bright look! Oh, that is cute! Kind of Bohemian :) The colors suit you so well. Love how you styled your shirt dress! Kindly keep a check on us from time to time. Wow I love your outfit! Thank you Tanya. :) Have a good day. Great look! Love the sandals! wow you look amazing! Love the bralette obove the blouse! Thanks Lara. :) Have a good day. Thank you so much Nidhi. It is still not that cold here in India. You could try wearing it with knee-high boots and a cozy turtleneck. Though, UK might be colder than we are anticipating. This outfit has such a cute boho vibe !!! Love the sunnies !